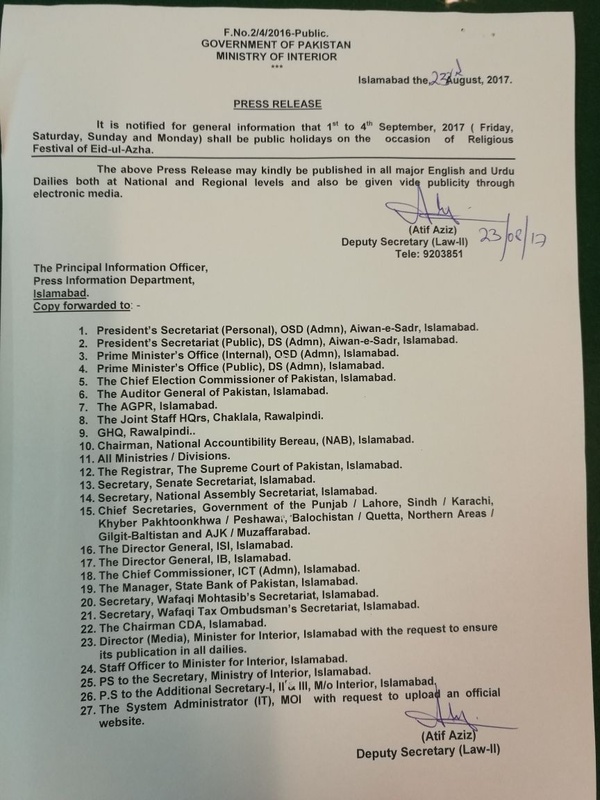 According to the Meteorological Department of Pakistan, Eid-ul-Azha will most likely be observed on 1st September, Friday. The moon of Zilhaj is likely to be observed on August 22nd, as reported by the Met Department. It is expected that the sky will be clear on this date and the moon will be clearly visible. A meeting has been arranged on August 22nd, to take place at the PMD camp office in Karachi. The meeting will be attended by the Ruet-e-Hilal committee. Meetings of the zonal/district Ruet-e-Hilal committee will also take place on the same date and time. Deputy Director Ministry of Religious Affairs and Interfaith Harmony Hafiz Abdul Qudoos said that all the members of the Ruet-e-Hilal committee have been invited. However, no member of the Peshawar’s Masjid Qasim Khan Committee has been invited, he told upon inquiry. There is often a conflict in the sighting of the moon. The origin of the conflict lies in the disagreement of Masjid Qasim Khan, with the Ruet-e-Hilal committee’s findings on the sighting of the moon. One such disagreement occurred on the sighting of the moon for Eid ul Fitr. Several efforts were made by the ministry to celebrate Eid collectively on one date in the whole country. However all efforts went in vain when Eid was celebrated a day earlier in parts of Khyber-Pakhtunkhwa and Fata. Another incident that occurred was when last year Mufti Muneeb-ur-Rehman, Chairman of the RHS got into a conflict over media’s premature coverage and announcement of moon sighting. A draft is now being prepared by the Ministry of Religious Affairs in light of the incident that occurred last year. Under the ‘Pakistan Ruet-e-Hilal Bill 2017’, no individual or media company is allowed to announce the sighting of the moon before RHC announces it. The responsible organisations, individuals or media groups will be faced with a fine ranging from Rs. 200,000 to Rs. 500,000 in case of violation of the rule. The bill is aimed at not only ending controversies regarding moon sightings, but also systematizing the working of RHC. Aik hi baat hai, woh apni baat samjha chuka hai, baki English classes kisi aur jaga le lay ga.
Eid ul Azha 2017 will be on 1st September in US/UK/Gulf etc, whereas on 2nd September in Pakistan, inshaALLAH. Official holidays will be announced 4 days, i.e. 1-4 September (Friday – Monday). Tuesday will be first working day. Treat this as an unofficial pre-notification by MoI. Don’t just carried away with the MeT dept’s tukkay!